1. What the experts say about raw, vegan and gluten-free pet diets? 5. What's in normal pet food? Home > News & Resources > Raw meat and vegan pet diets: are they good for our pets? Vegan, raw meat and gluten-free pet diets have swept the pet food market over the past couple of years, partially due to growing concerns about the additives used in pet food. Some of the benefits promised by proponents of alternative diets are improved health, more energy, better digestion, financial savings and environmentally-friendly manufacturing. But do these stand up to scrutiny? All Bought By Many pet insurance policies cover food prescribed by a vet. Also, check out our list of the best pet insurance and find out about the average costs of pet cover. Because these alternative pet diets are a relatively new trend, experts have not been able to gauge their risks and benefits with much certainty. But the popularity of alternative pet diets is growing. Veterinary surgeon Dr Neerja Muncaster told us that more owners ask her about alternative pet diets and express a definite interest in the raw food diet. She also stressed there isn't enough scientific evidence to support raw diets at present. Perhaps this is why views from veterinary scientist are now steadily trickling in to reveal a clearer picture of whether alternative diets could work for pet cats and dogs. A Raw food diet for pet dogs was first populirsed by Australian vet Ian Billinghurst in the 90s. He believed that pet dogs should eat what their ancestors did. 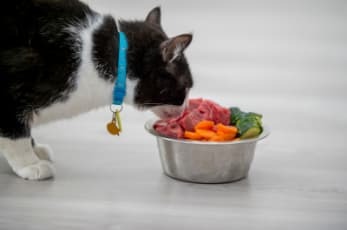 Since then some pet owners have started feeding their cats and dogs raw meat and many pet food companies have sprung up that offer the service. Advocates of raw pet food say it can be more nutritious than commercial pet food and that potential benefits include a shinier coat, more energy, healthier skin and teeth. However, many in the veterinary profession disagree with Billinghurst and suggest that the risks outweigh the benefits. And as veterinary surgeon Dr Neerja Muncatsre told us, "there simply isn't enough scientific evidence to support raw food pet diets. The president of the Raw Feeding Veterinary Society, Nick Thompson has acknowledged this evidence base discrepancy in the past." Studies have suggested that raw pet food might carry dangers of bacterial infections that can affect both pets and humans. Scientist in Sweden tested samples from 60 bags of raw dog food from 10 brands in 5 countries, including England. High levels of potentially harmful bacteria, such as salmonella and campylobacter were identified in 31 bags and E coli in 18 bags. In addition, all 60 samples of the food contained a type of bacteria that could indicate faecal contamination and low hygienic standards. 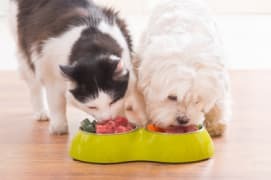 For owners who are seeking an alternative to commercial pet foods, Dr Lisa Freeman, a veterinary nutrition professor, recommends home-cooked meals and advises that the benefits seen from raw food are often the result of high fat content which can be achieved by feeding a high fat content diet. It is worth noting, however, that home-cooked food diets can be difficult to get right, too. Getting it wrong could mean making your pet ill.
"Homemade diets require great expertise, time and expense to formulate. There have been reported cases of rickets in puppies fed inadequate home-cooked diets," says Dr Neerja Muncaster. Always consult a veterinary nutritionist when thinking of improving your pet's diet. Handle with "separate kitchen equipment or with equipment that is washed thoroughly after use." Dr Neerja Muncaster's advice: "If owners are considering RAW, the PFMA (Pet Food Manufacturers' Association) website is a good source of information and I would encourage owners to choose one of the manufacturers who are registered with the PFMA and adhere to their strict guidelines." Always consult a veterinary professional for safety and best results. Dogs are omnivores, so they can digest plant-based food. So, does that mean they can thrive on an entirely meat-free diet? According to Daniella Dos Santos, Junior Vice President of the British Veterinary Association, in theory the answer is yes. However, she adds that, "it is much easier to get it wrong than to get it right and owners would need to take expert advice to avoid dietary deficiencies and associated disease." Cats are pure carnivores, which means they need meat to survive. In addition, their digestive tracts are not well-equipped to process fruits and vegetables. There are supplements on the market created to substitute for nutrients found in meat; however, not enough is known about how well they are assimilated and whether they won't interact with other nutrients in the diet. deficiency in vitamins, minerals and proteins that can only be obtained from meat. On the other hand, there are many commercial pet food sellers that offer vegan and vegetarian pet food that has been enriched with nutrients. However, those have only been around for a short while, and there have been no studies exposing pets to years of plant-based diets, which means the risks or benefits cannot be objectively evaluated for now. It's worth noting that a recent survey into veterinary nutrition attitudes of pet owners was wildly reported by the media as "27% of pet owners feed their pets a vegan diet". In reality, the 27% of these pet owners were a small sample of the 6% vegan pet owners that took part in the survey, which translates as only 59 people out of the 3,673 surveyed, or 1.6%. So very few pet owners are taking the risks of putting their pets on a meat-free diet. As more and more people give up gluten by choice, the trend is taking over the pet food market, too. However, in spite of many reports in the popular media that abstaining from gluten can improve your health and boost your energy levels, there is no evidence that suggests that a gluten-free diet has any benefits for people and pets who are not gluten intolerant. Gluten-free or grain-free foods for dogs have gained popularity with claims that they are higher quality by implying that grains are cheap filler for commercially manufactured cat and dog food. "While this can be true if the proportion in a recipe is too high, it’s not true all the time," says Tails.com's Head Vet Sean McCormack. Whole grains are rich in important nutrients and contain fibres that help digestion. "Grains are good for most dogs, as part of a balanced diet," says Dr McMormack. What's in normal pet food? An in-depth pet food report by Paws.com revealed that "95% of dog foods owned by big brands don't reveal their exact ingredients". Furthermore, the report points out that many big brands use vague wordings, such as "meat and animal derivatives", in their labels to avoid stating the exact parts of an animal that the meat content has come from. This means that more often than not these foods contain meat parts that are not very nutritious. 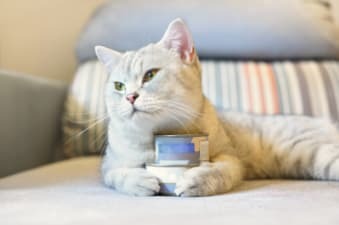 Paws' report identifies supermarket's own-label pet foods as the biggest culprits of such label-writing techniques. Big brands come second. But in spite of the bad rap, long-term studies show an extended lifespan in pet animals since the introduction of such mass-produced pet foods. It is thought that, alongside veterinary medicine advances and better living conditions, commercial pet food has played a part in that. Pet owners have voiced concerns about meat in these foods possibly being treated with antibiotics and other additives. But antibiotics are wildly used in livestock in order to prevent the spread of disease. It's regarded as a controversial method but affects human food too and would still be used to treat the raw meat in a raw food pet diet. While some brands might use cheaper ingredients to lower the cost and add more preservatives and additives to increase shelf-life or improve flavour and texture, it is important to remember they are not all the same. Paws' report can be a good guide for owners shopping for normal pet food. Becoming more aware of what to look out for and what to look for can help owners to avoid low-quality pet food. Furthermore, there are new pet food brands that offer high-quality pet food, including tailor-made, such as Tails and Paws. A number of new companies now offer subscription pet foods. These brands say they use ingredients of the highest quality that they list clearly and in full. The majority employee vets or veterinary nutritionists to formulate the foods and oversee the quality. Some, like Paws.com and Tails.com offer tailor-made foods, designed specifically with your pet's needs, activity levels, weight and age in mind. These brands aim to deliver a complete balanced nutrition while using high-quality products and ingredients. Bear in mind they might be more expensive than pet food you can buy in your local shop. They are, however, likely to be the same price as, or cheaper than, raw pet food or meat-free food. "I would encourage them to do their research but also to actively engage with their veterinary professionals who will help them make informed decisions. There is no perfect diet that will suit every pet. Cats are obligate carnivores, so a vegan diet would be detrimental to their health." She says that sometimes people would consider an alternative diet when there's an illness involved, such as an allergy or inflammatory bowel disease. 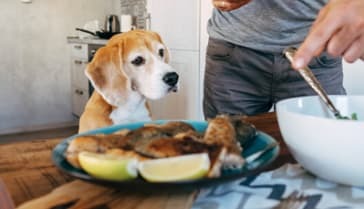 She suggests that owners can even be swayed by their own dietary preferences but explains that very few vegan or vegetarian pet owners she's seen have considered putting their pet on a meat-free diet. "The majority of owners understand the different dietary requirements our pets have," says Dr Muncaster. Dr Muncaster on important pet topics in 2019. The idea of cleaner, more nutritious food for our pets is a good thing. However, it's worth noting that getting the right balance of nutrients from an alternative diet is tricky and there is a lot of room for mistakes. In addition, the effects of raw meat, meat-free and gluten-free diets are unknown and uncertain. If you're considering changing your pet's diet, make sure to do so with support and guidance from your vet or another veterinary professional.